Last weekend there was, I’m sure you’ll agree, some crazy football. I feel for you Bears fans. But the show must go on. The divisional round of the playoffs are continuing on with more juicy matchups. For everyone who’s in the Gridiron Hub Playoff Challenge, remember to set your lineup and prepare for this weekend’s games – here’s my preview! First off, we hit the ground running with an absolute cracker. The red-hot Colts are traveling to Arrowhead to visit MVPat and co, (9:35pm GMT Saturday). The Kansas City Chiefs have looked absolutely incredible this year, there’s no other way to put it. If this matchup happened 10 weeks ago, I wouldn’t be so excited, but with the momentum that the Indianapolis side have coming in gives them as much a chance as they could ever have to cause an upset. Marlon Mack and Andrew Luck are truly dangerous on any play, and with T.Y Hilton and unlikely star Tight End Eric Ebron being let loose against a distinctly bad defense, anything can happen. 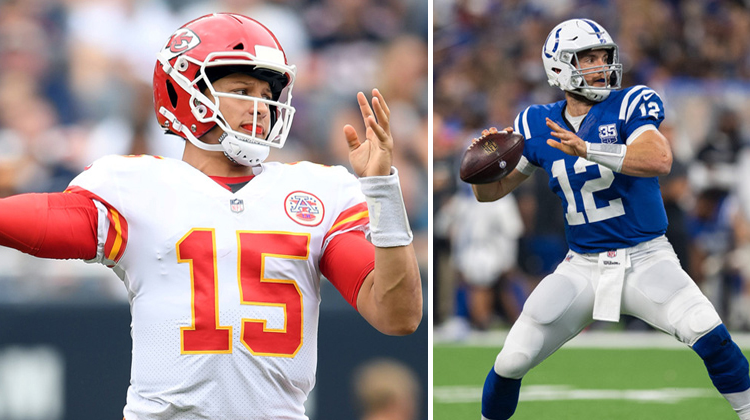 The Chiefs obviously have a few offensive weapons too, and I expect many of them to feature in you guys’ lineups in the playoff challenge – Mahomes, Hill and Kelce will all be very popular choices – I think that the Colts defense is going to have to be inch-perfect to shut this offense down. The one thing which I can promise is that this won’t be another game where the kicker is the star of the show (ffs James…), but other than that this game is more unpredictable than most people think. We have yet to see Mahomes with the playoff pressure on his shoulders, and more importantly we have seen Andy Reid. This one will be another good game, but I suspect that I do know how this one will end. 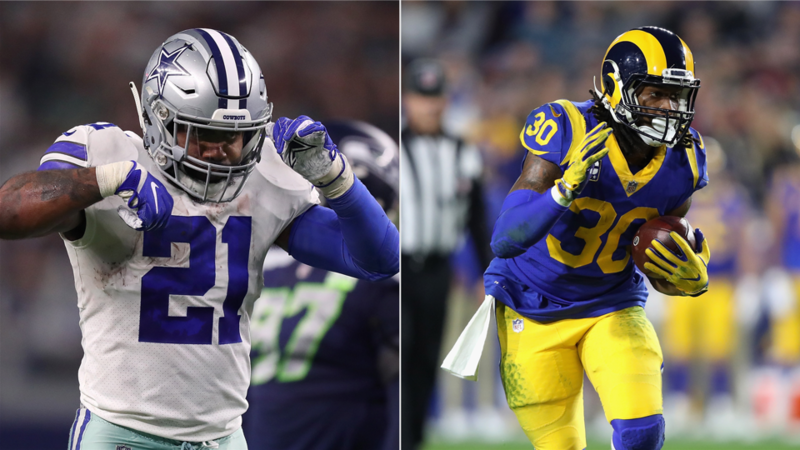 The Rams seem ready to prove themselves but the Cowboys plan on doing the exact same thing, when they visit Los Angeles, (1:15am GMT Sunday). The Rams offense is a very aggressive, balanced one – built around Todd Gurley, but not to the extent that they can be considered a run-heavy team. The Cowboys on the other hand are a very run-first offense, they gave their stud running back, Ezekiel Elliott, 26 rushing attempts last week (for 137 yards and a TD) against the Seahawks. One of the key things to watch this week will be how the defenses play, particularly which element of the game they are most successful with. If the Rams can force Dak Prescott to throw the ball, I believe they will win. The most powerful thing that the Rams have is the balance I described earlier, Jared Goff has really stepped up this year to show that he can make some big boy throws. I am hoping (for entertainment purposes) that the Cowboys stout run-D forces Goff to see if he can do it in the playoffs, too. I think the Rams will win this game, but I would love to see dem ‘boys actually put up a fight and make McVay sweat a bit. I think that the Chargers need their defense to win them the game, as their offensive unit has been very inconsistent recently. 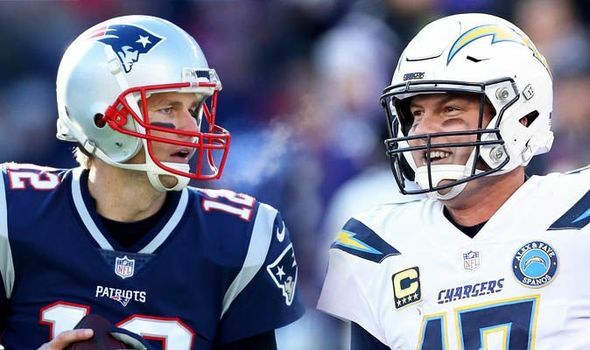 Last week, the Chargers best player was their kicker, so let’s not make any mistake, they will have to be much better for this game to live up to it’s potential, but if it does we are in for a cracker. Phillip Rivers scares the hell out of me both in fantasy terms and in leading this offense at the moment, but I am hoping that Melvin Gordon gets going and takes the pressure off, to open up the passing lanes for Keenan Allen and co. Tom Brady scares me for a slightly different reason, he scares me because he is so damn good at winning. I think this game will be decided late in the fourth quarter, and I can’t wait to see who comes out on top. I told you which games are most interesting, and what some interesting things to look out for would be – but this is the game which has the big boy in it. The best narrative in all of football right now. B D N. Mr Foles is the hottest story in the NFL, and for good reason – and this is undoubtedly the toughest test he has faced since he won Super Bowl MVP. The Eagles are traveling to the ‘dome to face the Saints (9:40pm GMT Sunday). 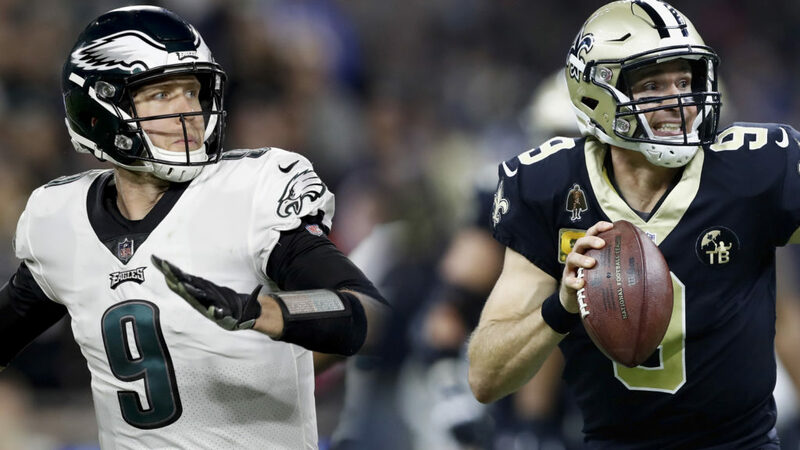 Drew Brees and Sean Payton are no less scary than the QB-HC duo which Philly toppled in February last year, and with a supporting cast including Alvin Kamara, Mark Ingram and Michael Thomas, New Orleans are billed by many as Super Bowl winners. But if the Saints want to get their hands on the Lombardi trophy and their $225k (as shown to them by Payton this week) they have to dethrone the current champs. On the Eagles offense there aren’t so many star names as the home team, but damn do they make it happen in the playoffs. I don’t know if any of you are getting bored of this Saint Nick narrative, which has returned again since Christmas, but if you are, you’d better hope that he loses this weekend, because if the Eagles make it past this obstacle, I don’t think anything will stop them. The key to this game for the traveling side is their defense, they need to take the pass away as much as possible, in the hope that they get Ingram on the field instead of the much more dynamic and troublesome second-year RB, Kamara. I would love for the fairy tale to continue, but I suspect the Saints to win. I can’t wait for this weekend’s games. In the Wildcard games last week, the highest scoring game of the group was the Cowboys win with a total score of 46. I had a look at the line for the games on SkyBet for this weekend… every single game has an over/under of above 46 points, and I want to see these games deliver, because last week I saw way too many field goals. Good luck this weekend, everyone.